The Trench is the only waterway that a ship can take to get to the western continent. Unfortunately, there at the entrance, between the twin peaks of Seidar and Phaestia, prowls Ol’ Sly, a gigantic squid creature that would like nothing more than to crack a ship open like a jaca fruit, and pick the sailors out and eat them like the sweet seeds. Small Fry and the Admiral have a plan, though. They mean to take down Ol’ Sly once and for all, and open the western continent to their ships. Afterward, Rish and Big try to decide what really is the worst way to wake up, live squid or porcupine covered in hair gel? Oh, and song. You have been warned. Special thanks to Justin Charles for producing the story and doing the episode art, and to Julie Hoverson for lending her voice to the tale. Some sounds are courtesy the free sound project. Come discuss it with us in our forum. 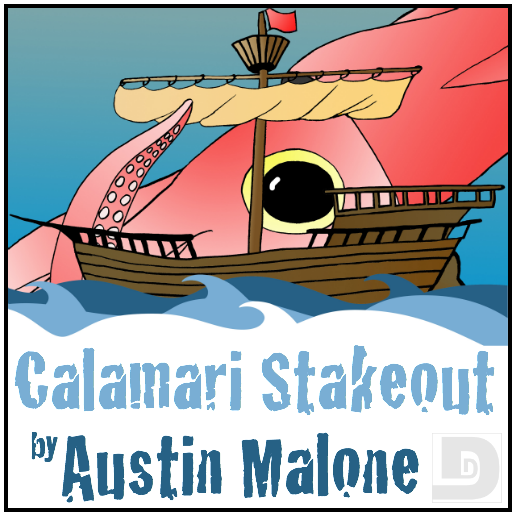 This entry was posted on February 28, 2015 at 10:48 am and is filed under Austin Malone, Fantasy, Short Story, TWSC. You can follow any responses to this entry through the RSS 2.0 feed. You can skip to the end and leave a response. Pinging is currently not allowed. You surprised me in the intro, Rish. I have admired the character work in your narrations, but the singing! When you finally pulled out a few more stops, your singing does not really lose to many pop singers. Liked the story, too, again. The stories you choose are quite often to my taste, in all their eclecticality.